White Lotus Home understands how challenging it can be for our customers to make a decision without seeing, feeling, smelling or otherwise testing our organic products. For those who do not live near our showrooms, we offer both FREE samples and paid samples of everything we handcraft in the USA. We send these out all the time and know that it makes it easier for our customers to make a better natural bedding decision. Please note that no samples can be provided of furniture. Our fabrics: Complimentary swatches are available of all fabrics. Raw Fibers: Free, individually bagged samples of the organic and natural fibers used to make mattresses, pillows and bedding. All these fibers and fabrics contain no added chemicals or flame retardants (the exception being the Green Cotton with Borate Powder). Each fiber will be individually bagged and labeled with full descriptions. Wholesale fibers are available in for purchase. Mattress Samples: These 18x16x6" cushions allow you to test our mattresses in the comfort of your own home. As these are the size of a chair cushion, the samples will give you a good idea of how a full-sized product will feel. Mattress Toppers: Topper samples can be paired with a mattress sample or an existing mattress to feel the comfort White Lotus Home Topper can add. 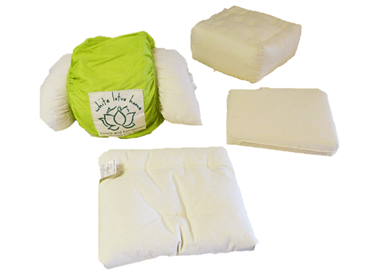 Pillow Sample Set: Our Pillow Sample Set contains one of each style pillow --- Kapok, Organic Cotton, Green Cotton, Wool, Organic Buckwheat and Shredded Latex. Each pillow measures approximately 2x4". All samples are treated as store credits towards a future purchase. Up to two mattress samples can be applied to your future mattress order, or one pillow sample set towards a pillow. For example, if you were to order two mattress samples in different styles totaling $100, we would subtract that $100 credit from your final total. Mattress sample credits are valid for one year from date of purchase. The cushions are then yours to keep --- it's a risk-free way to find your perfect fit!